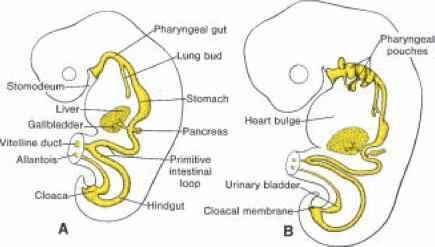 Primordial germ cells appear in the wall of the yolk sac in the fourth week and migrate to the indifferent gonad (Fig. 1.1), where they arrive at the end of the fifth week. In preparation for fertilization, both male and female germ cells undergo gametogenesis, which includes meio-sis and cytodifferentiation. During meiosis I, homologous chromosomes pair and exchange genetic material; during meiosis II, cells fail to replicate DNA, and each cell is thus provided with a haploid number of chromosomes and half the amount of DNA of a normal somatic cell (Fig. 1.3). Hence, mature male and female gametes have, respectively, 22 plus X or 22 plus Y chromosomes. Birth defects may arise through abnormalities in chromosome number or structure and from single gene mutations. Approximately 7% of major birth defects are a result of chromosome abnormalities, and 8%, are a result of gene mutations. Trisomies (an extra chromosome) and monosomies (loss of a chromosome) arise during mitosis or meiosis. During meiosis, homologous chromosomes normally pair and then separate. However, if separation fails (nondisjunction), one cell receives too many chromosomes and one receives too few (Fig. 1.5). The incidence of abnormalities of chromosome number increases with age of the mother, particularly with mothers aged 35 years and older. Structural abnormalities of chromosomes include large deletions (cri-du-chat syndrome) and microdeletions. Microdeletions involve contiguous genes that may result in defects such as Angelman syndrome (maternal deletion, chromosome 15q11-15q13) or Prader-Willi syndrome (paternal deletion, 15q11-15q13). Because these syndromes depend on whether the affected genetic material is inherited from the mother or the father, they also are an example of imprinting. Gene mutations may be dominant (only one gene of an allelic pair has to be affected to produce an alteration) or recessive (both allelic gene pairs must be mutated). Mutations responsible for many birth defects affect genes involved in normal embryological development. In the female, maturation from primitive germ cell to mature gamete, which is called oogenesis, begins before birth; in the male, it is called spermatogenesis, and it begins at puberty. In the female, primordial germ cells form oogonia. After repeated mitotic divisions, some of these arrest in prophase of meiosis I to form primary oocytes. By the seventh month, nearly all oogonia have become atretic, and only primary oocytes remain surrounded by a layer of follicular cells derived from the surface epithelium of the ovary (Fig. 1.17). Together, they form the primordial follicle. At puberty, a pool of growing follicles is recruited and maintained from the finite supply of primordial follicles. Thus, everyday 15 to 20 follicles begin to grow, and as they mature, they pass through three stages: 1) primary or preantral; 2) secondary or antral (vesicular, Graafian); and 3) preovulatory. The primary oocyte remains in prophase of the first meiotic division until the secondary follicle is mature. At this point, a surge in luteinizing hormone (LH) stimulates preovulatory growth: meiosis I is completed and a secondary oocyte and polar body are formed. Then, the secondary oocyte is arrested in metaphase of meiosis II approximately 3 hours before ovulation and will not complete this cell division until fertilization. In the male, primordial cells remain dormant until puberty, and only then do they differentiate into spermatogonia. These stem cells give rise to primary spermatocytes, which through two successive meiotic divisions produce four spermatids (Fig. 1.4). Spermatids go through a series of changes (spermiogenesis) (Fig. 1.25) including (a) formation of the acrosome, (b) condensation of the nucleus, (c) formation of neck, middle piece, and tail, and (d) shedding of most of the cytoplasm. The time required for a spermatogonium to become a mature spermatozoon is approximately 64 days.